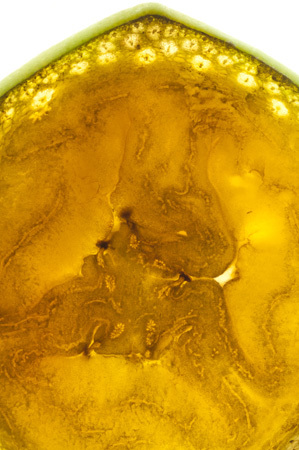 In November 2010, Jake began a series of macro photography that he called Food Within. 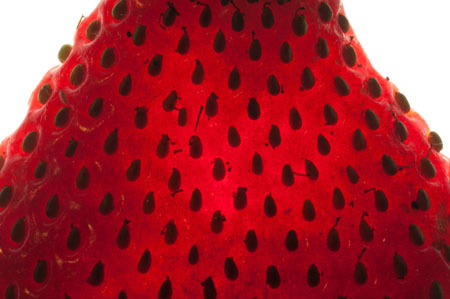 Some like the strawberry are fairly easy to identify. 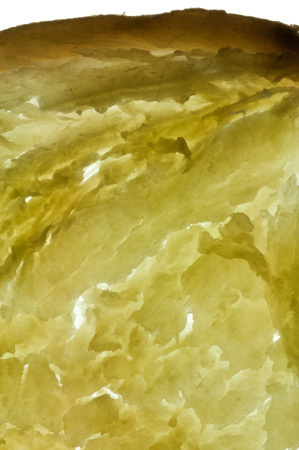 The food was sliced thinly and backlit, others appear as textures or landscapes. He took great delight in asking people to guess what each was. 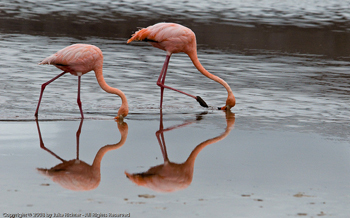 Bonaire is well known for its flamingos, which can be found most anywhere there aren't people and where this is a food supply. They waggle their heads back and forth across the mud or in shallow waters to locate their meals. 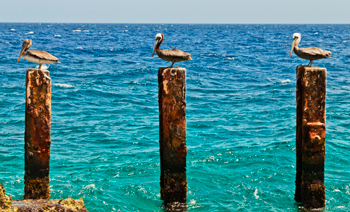 Pelicans are Bonaire's friendly aerial hunters of fish. While you may usually see one around boats, seeing them all lined up on three parallel pilings is unusual. 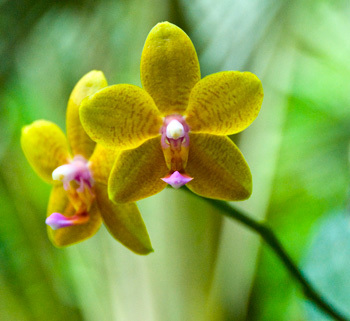 Flowers come in an amazing variety around the world, and prettiest among them - and perhaps the also the most unusual - are orchids. 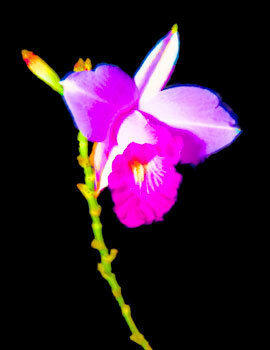 This orchid seems to almost glow due to its coloration. Bonairean architecture from over a century ago, constructed with mud, rock, and plaster, still stands in places all over the island. Many such structures are still in regular use, although occasionally one encounters buildings that have seen better days. 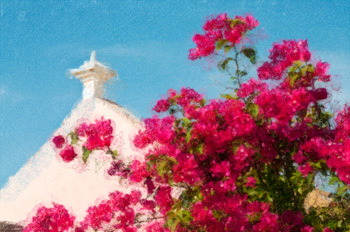 However, even these provide a real sense of age and history of Bonaire and are treasures in their own right. 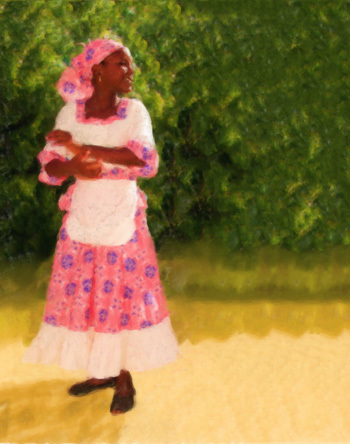 Every year, Bonaire celebrates the Queen's Birthday with Rincon, and Bonairean women will wear traditional clothes to celebrate the day. Here such a Rincon woman is depicted enjoying the moment. Bonaire's flag shows the spirit of its people. 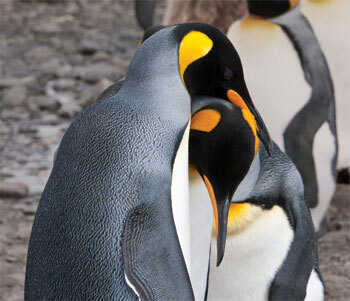 The blue is for the ocean, the yellow for the sun and flowers, the white for the purity of its people. 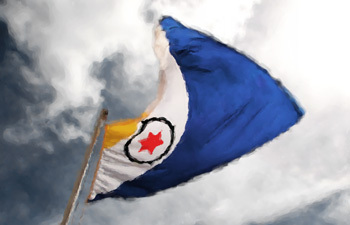 The black compass honors Bonaire's Mariners, and the red star represents the six neighborhoods of Bonaire and the fighting spirit of its people. 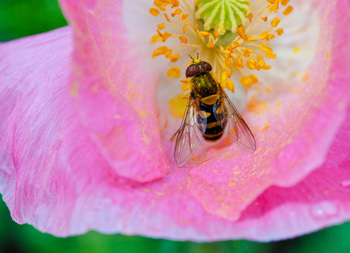 Bees are the world's most important plant reproduction organism, as the pollen they collect spreads to other plants and pollinates them, helping diversify gene pools at the same time. This bee is doing its best toward that goal. Sunsets are beautiful when water is involved, a theme that is recurring in my images. 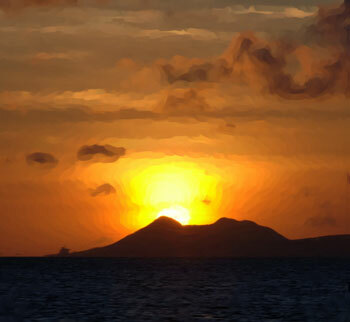 Here I have tried to represent a sunset in the summer months at the northern end of the Caribbean island of Bonaire, with Mount Brandaris silhouetted against the sun, and dark yet reflective ocean in the foreground. Nature creates wonderful patterns, and in the ocean some of the most incredible patterns can be found in soft and hard corals. 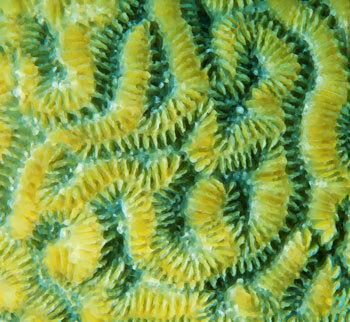 There are several species of brain coral, aptly named because their meandering crests resemble the appearance of the exterior of a mammal’s brain. However, to me, the most amazing thing is that a coral’s colors are actually the result of a separate organism – zooxanthellae – a type of algae which lives in symbioses with the coral. So, this image represents both the simplicity of a natural and random pattern and the complexity of the interrelationship of multiple life forms. Sea turtles, while being incredibly graceful underwater and clumsy on land, are at the same time an oddity – a marine reptile. In the waters around Bonaire, where I live, turtles are not abundant, but due to various legal protections and a local conservation group their numbers are at least stable. 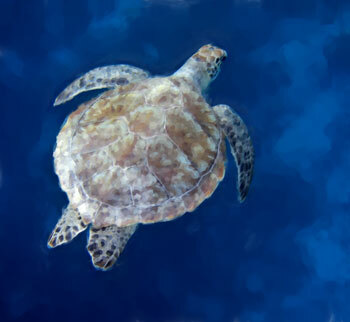 However, it is always a thrill to swim with one, and this image is based on time I spent snorkeling with a green turtle in Bonaire’s beautiful waters. Many of us see bromeliads on a regular basis – pineapples, for example. 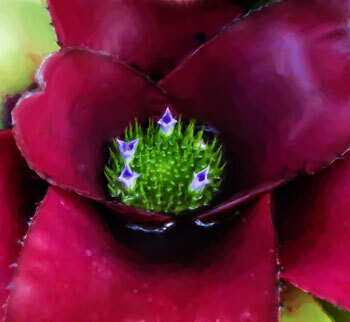 However most don’t realize that bromeliads come in a variety of colors. I found this incredibly richly colored bromeliad in Chattanooga, Tennessee, in the tropical gardens of the excellent Chattanooga Aquarium, but what really caught my attention were the bromeliad “babies” forming in the midst of the water-filled interior of the parent bromeliad. The brightness and contrast of the colors of the leaves, blossoms, and reflection of the water were captivating, and also difficult to represent properly. Often heard, but rarely seen, bullfrogs are both beautiful and ugly at the same time. Some of their ugliness stems more from stories and fairytales, although arguably, on the flip side, Kermit the Frog made frogs cute. 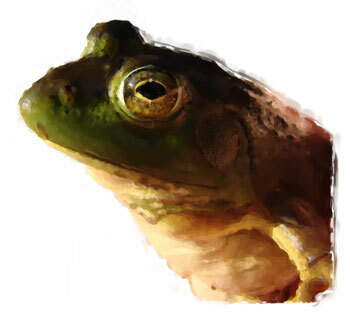 One evening while at a pond in New Hampshire, I caught a bullfrog, and decided to do a detailed study of it, as seen here. 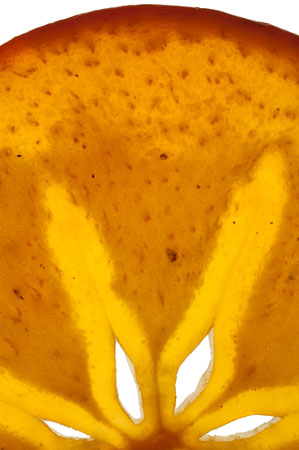 The complexity of the eye, combined with the odd appearance of the tympanic membrane (ear) is contrasted by the rich green and brown color of the bullfrog. 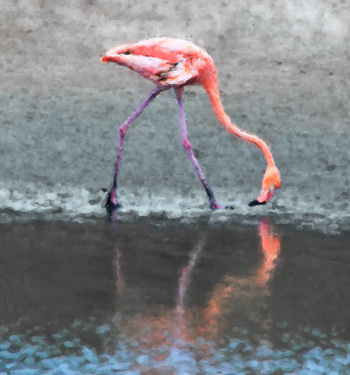 This is a giclee limited edition print of 75 in a closed edition. The print area measures 10x10.8", archival paper 13x19, and pigment ink. Print area includes some extra white space in this particular print. 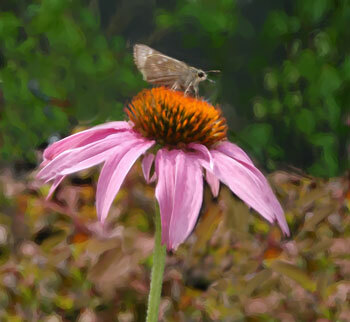 A visit to a farmer’s market in Nashville, Tennessee, inspired this image, when I spotted a butterfly feeding on blossom of what appeared to be a pink daisy in the floral and garden section of the market. What intrigued me about the scene I saw was the plain appearance of the butterfly in contrast with the vivid colors of the bloom it sat upon. 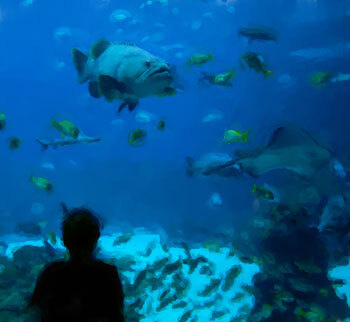 We were visiting the Georgia Aquarium in Atlanta, and while my son was watching the wildlife in their giant aquarium tank, this fish, formerly known as a Jewfish, and now renamed a Goliath Grouper, took an interest in my son. They both hovered in their respective positions for quite some time, cautiously observing each other. Perhaps each was considering the other as a viable food source? 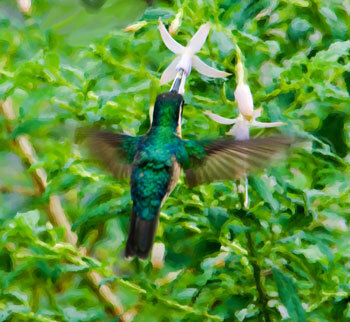 Hummingbirds should perhaps better be named “Hoverbirds” due to their ability to hover in place – a skill that is necessary to feed on the nectar of blossoms with their long tongues, which in turn are inside long beaks. This image is based on a hummingbird I saw in the mountains of Costa Rica. 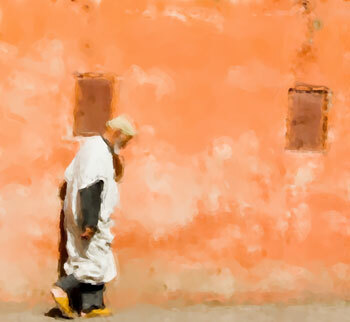 The bright sun in Casablanca reflected off the faded wall as an old man walked by, evoking a sense of both serenity and antiquity that I felt I needed to capture and try and reproduce. There is a certain timelessness to the Moroccan Wall as well – it could be an image from yesterday or a hundred years ago. 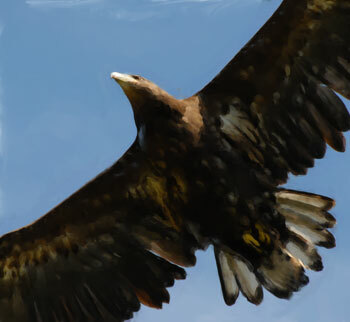 Whenever I see raptors – birds of prey – in the air above me, I stop to watch them. There’s a certain calm and serenity about them, but yet a type of predatory sensation. 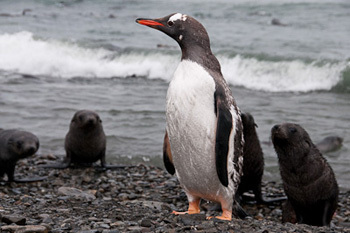 And if you’re lucky enough to see their eyes, you get the idea that they are very focused on the hunt at all times. Serene and intense all at the same time. This particular eagle was spotted in England. The colors of a summer sunset somehow always look more beautiful when reflecting off a body of water. 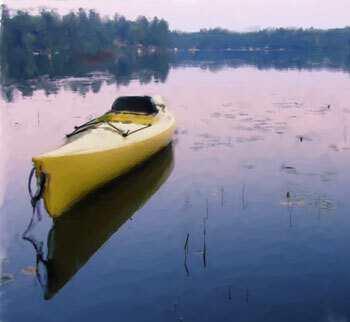 Here, that effect can be seen on a pond we spent a week at in New Hampshire, relaxing, fishing, and kayaking. Night. Lights. Action. Vibrancy. 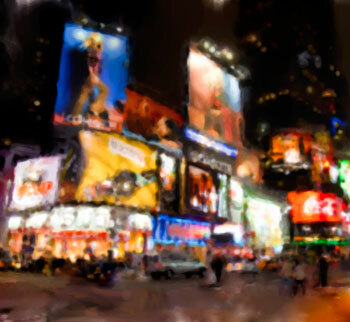 All of these describe Manhattan's Times Square after the sun has gone down. Each building facade strives to stand out from its peers, with a little more color here, and a little more dazzle there. Yet traffic and pedestrians continue about their ordinary paths, seemingly oblivious to the man-made wonders around them. Most visitors to the Caribbean island of Bonaire know that its waters are its top attraction, but many don’t realize that scuba diving and snorkeling are not the only things to be done in the aquatic realm. 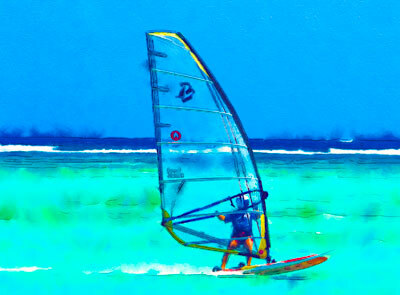 Bonaire is also a top windsurfing destination, and the vivid colors and shapes of windsurf equipment hold their own against those of the marine life under the sea. There’s a breathless, dream-like quality to seeing a windsurfer race the wind, and that’s what I have captured here. Most of us are used to flowers blooming by day, but when I was in the middle of the jungles of the Tortuguero area of Costa Rica in the dark looking for nocturnal wildlife, I stumbled across a number of orchids fully exposed to the world around them, apparently absorbing the rays of night. The reflection of light from my flashlight from these orchids was dazzling against a sea of black, and inspired this vivid image. 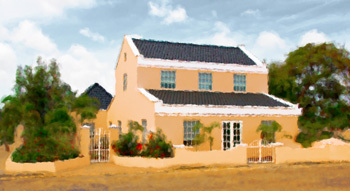 Architecture on the Caribbean island of Bonaire is built with simple materials – stone and mortar. 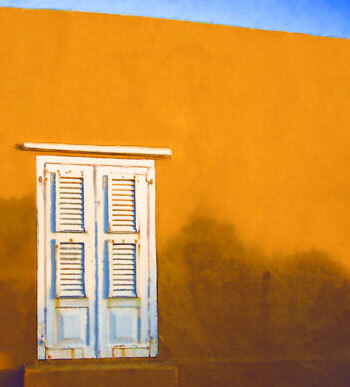 But simplicity lends itself to visual comfort as well, catching light in eye catching ways. 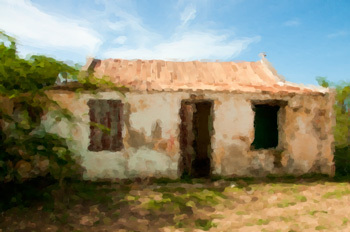 This particular image is based on a door to one of the building at the Slagbaai area in Bonaire’s Washington National Park – a building that represents generations of building tradition and technique. In a world where many things try to camouflage their existence and blend into their surroundings, the poison dart frog must be admired for wanting to stick out and make its presence known. 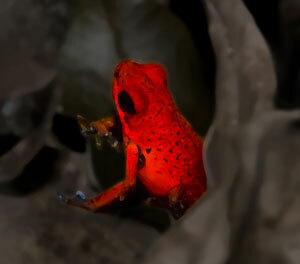 Of course, anything that messes with the poison dart frog will soon regret it, which presents an interesting message about what it takes to stand out from the crowd and survive. 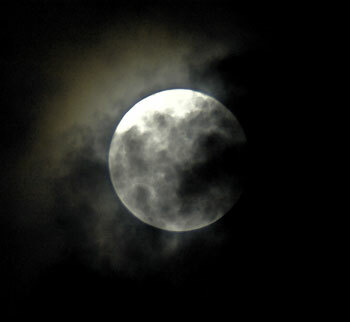 And it led me to compose this image in homage. Perhaps one of the world’s most recognizable statues, the Statue of Liberty, located just south of Manhattan in New York, served for many decades as the beacon for hope and opportunity for many thousands of immigrants seeking a new life in the United States of America. Planes had replaced ships by the time my parents immigrated to the USA, so they did not pass under the Statue’s majestic heights, but high over her instead. Either way Liberty welcomed them to a new life too. 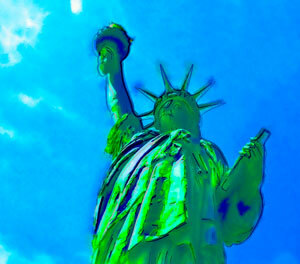 My image is intended to reflect the ethereal quality of Liberty, preserving her shape while still leaving her boundless in her reach. 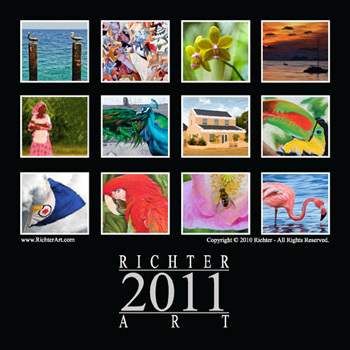 The 2009 Richter Art Calendar is an art wall calendar featuring 12 images of Linda Richter’s oil paintings, Jake Richter’s digital paintings, and introducing Krystyana Richter's colored pencil abstracts. 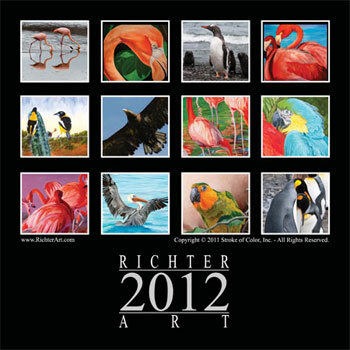 Each month’s image is protected by a gloss varnish. 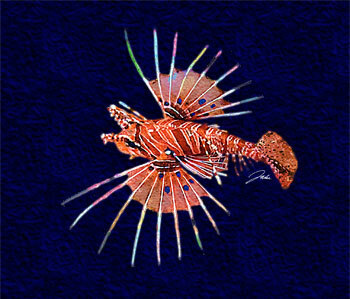 One of the most amazing creatures I found in the water during dives in Fiji were lionfish. Armed with toxic spines, not much will mess with one, and the lionfish know it, and their lazy swimming and relaxed poses merely reinforce that this beautiful fish is one best observed and otherwise left alone. All work contained throughout this Web site is Copyright © 2005-2014 by Jake Richter - All Rights Reserved.